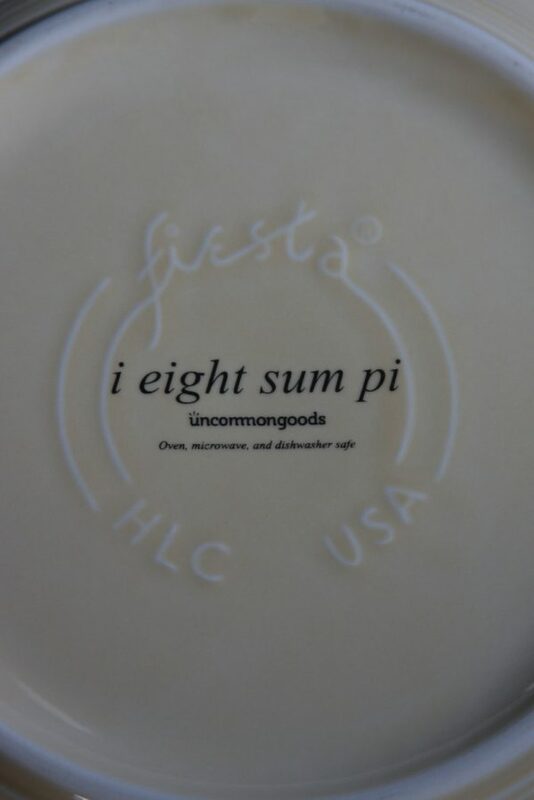 The day that unites math nerds and pastry enthusiasts across the country is upon us! 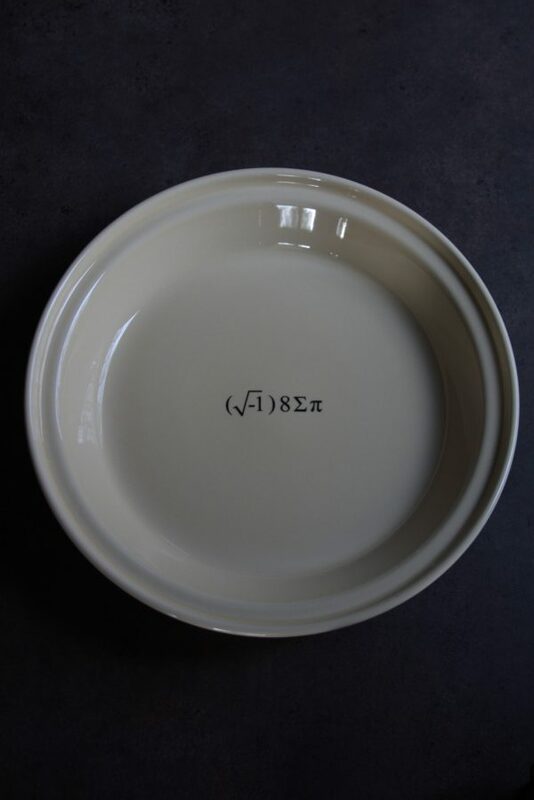 Pi day is less than a week away! If you’re not familiar with Pi day, the first 30 seconds of the video below sums it up nicely. Basically, Pi in math approximately = 3.14 which on an American calendar would translate to 3/14 or March 14th. 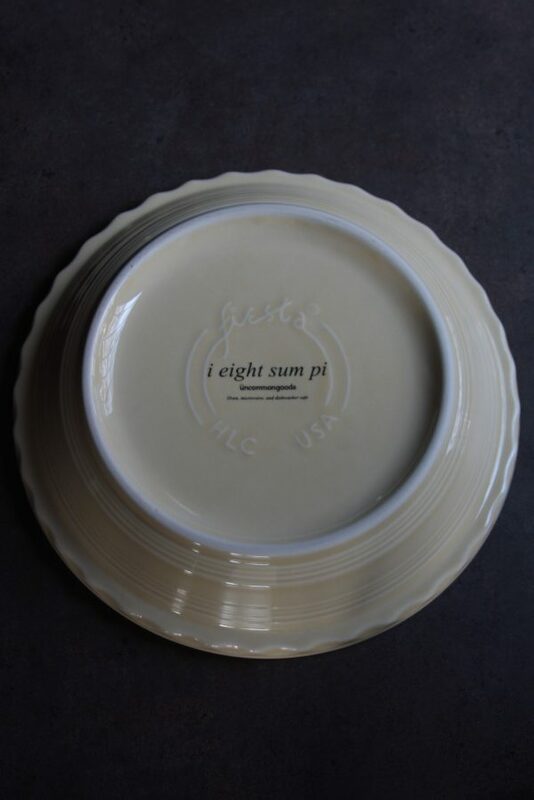 Pi sounds like pie so on Pi day you eat pie! Get it?! I warned you. 😀 With all of this nerdy goodness on the horizon, you better believe there are going to be several pies coming at you this week. We’ll kick things off with a pie that I’m honestly not normally a fan of. I made this for one of our game night crew’s birthday. I used it as an opportunity to try a different twist on a classic pie and oh my goodness did it ever work out. I’d be hard pressed to eat a full slice of a regular pecan pie but I’d go in for seconds with this one. I think the things I’m generally not a fan of in pecan pie are the gelatinous filling and the sort of bland flavor. Texture is a big thing with me and while pecan pie is always sugary, there sometimes isn’t much else to complement the pecans. I’d rather just eat candied pecans. To fix this, I mixed chopped pecans in the filling as well as putting them on top so there’d be ample crunchy texture throughout. Then, you always see maple bourbon flavored this that and the other everywhere, so I figured I’d give that a shot to complement the pecan flavor. My friends…it worked. 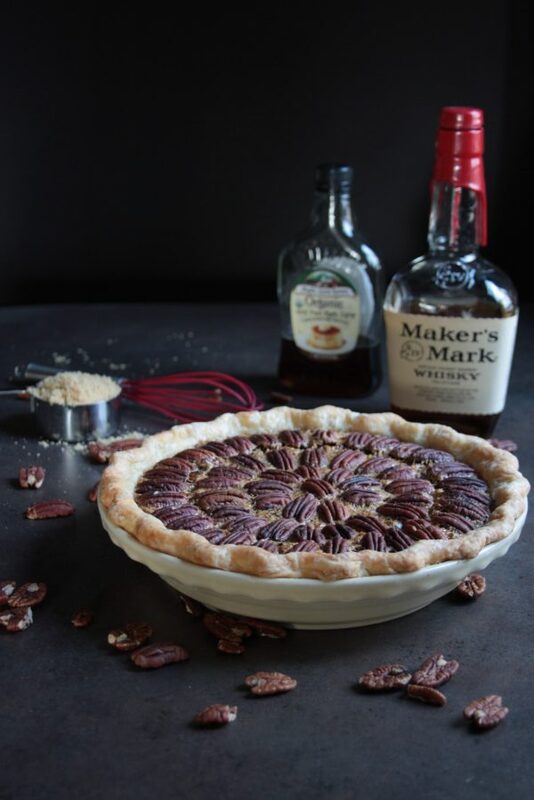 Toasted pecans with maple and bourbon on a buttery, flaky crust = a winning flavor combination. It actually worked out perfectly because my husband bought the Maker’s Mark a while back to see if he’d like bourbon. Turns out, he doesn’t. 😛 We’ve been trying to use it up in cooking or pawn if off on guests who enjoy it. 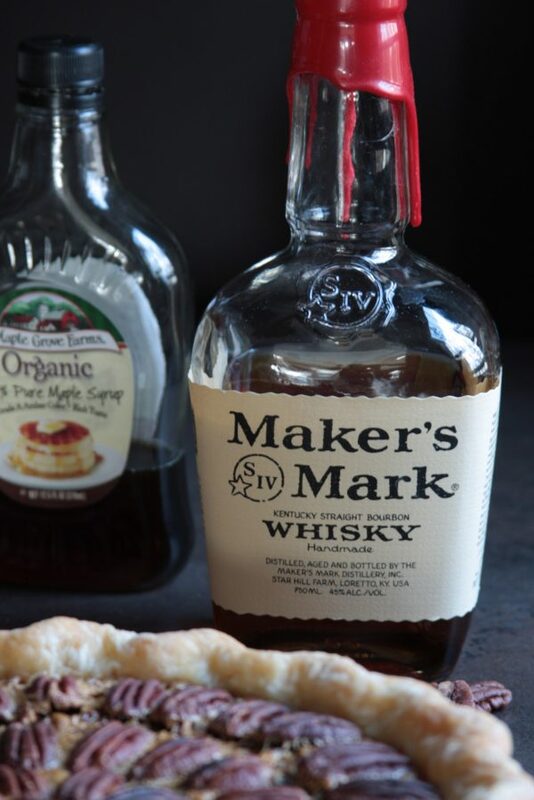 It just so happened that the pie recipient DID enjoy bourbon AND we got to use some of it up in this pie. It was a win-win. 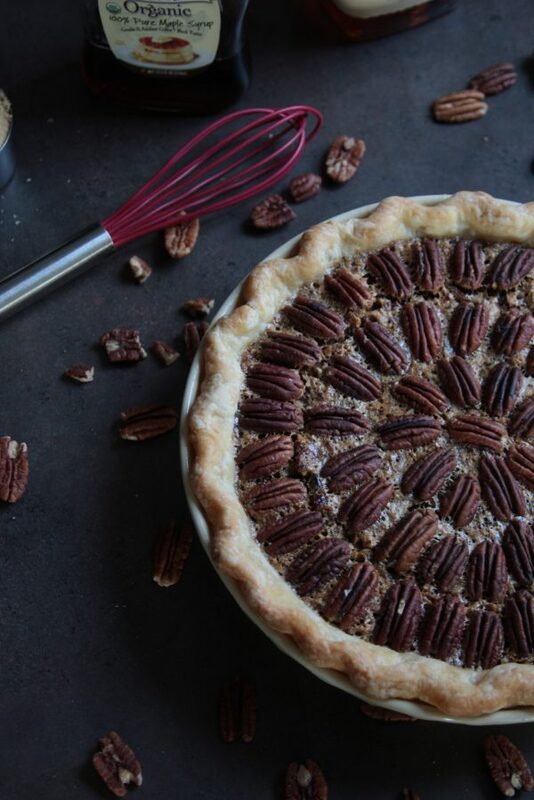 A twist on the classic pecan pie. The maple syrup and bourbon flavors pair spectacularly with the pecans and brown sugar. 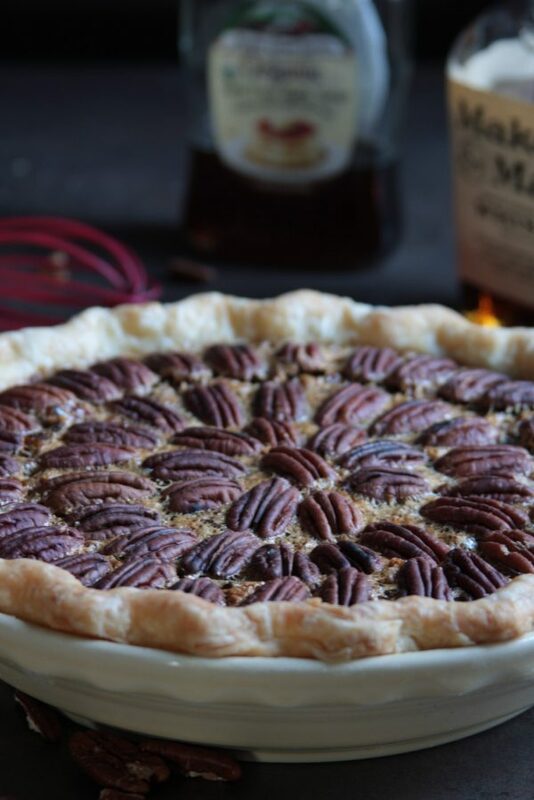 I normally don't care much for pecan pie or bourbon, but I'd eat this pie all day long. It's that good. 1/4 cup pure maple syrup 59 ml, You need the flavor of the real stuff. Mrs. Butterworth's or Hungry Jack won't cut it. 1/4 cup bourbon 59 ml, I used Maker's Mark but you can use your favorite bourbon or whiskey. Cut the butter into small cubes. Use a pastry blender*, two knives or a food processor to cut the butter into the flour mixture until you have lumps the size of small peas. Add 2 tablespoons of the ice water and use a fork to toss the mixture. Add one additional tablespoon of water at a time and continue tossing until the mixture starts to come together and can easily form a ball. Form the dough into a ball, then flatten it into a disk. On a floured surface, roll the dough out. Start from the center and roll up, start back at the center and roll down, then turn the dough a quarter turn to ensure it's not sticking to the surface. Lightly flour the rolling pin, work surface and dough as needed and continue this process: roll up, roll down, quarter turn, until the dough is about 1/8" thick and is about 12" in diameter. Transfer the dough to the pie plate. Rolling it around the rolling pin or folding it in half or in quarters can help to safely move it. Gently press the dough into the pie plate and trim the overhang so you have at least one even inch all the way around the plate. Fold the overhang back by at least half an inch and press it into the backside of the crust to form a lip that stands above the pie plate. Crimp the edges however you'd like. Keep in mind, butter crusts don't hold their shape as well as shortening crusts while baking so small details will cook out of any design. Large, simple crimps work best. Carefully cover the dough with plastic wrap and refrigerate for at least 30 minutes. When the dough is completely chilled, preheat the oven to 400 degrees. Crumple a piece of parchment paper so it will form to the shape of the pie crust more easily. Remove plastic wrap and place the parchment over the pie crust. Fill the crust with pie weights, uncooked beans or uncooked rice. I always use rice and keep it in a separate container to use over and over again. Bake for 10-12 minutes then remove the pie weights and parchment paper, prick the bottom of the crust all over with a fork, and return to the oven for another 6-8 minutes until the bottom just barely starts to set and turn a very light golden brown. Watch the edges and if they start to brown too much, add a pie shield* or tin foil to the edges. Heat a skillet over medium high heat. You can toast the chopped pecans and pecan halves together and then just separate them after, or toast them separately. Once the skillet is hot, add the pecans. Keep a close eye on them and toss them frequently because they can burn quickly. Continue to toss them for 5-10 minutes or until they just begin to brown and release a toasted, nutty aroma. Even after they are removed from the heat, they will continue to cook so continue to toss the pecans occasionally as they cool or they could burn. Reduce oven temperature to 325 degrees and set oven shelf on the lowest level. Baking the pie on the bottom shelf will help to ensure the bottom of the crust browns nicely. Place syrups, sugars, bourbon and butter in a medium sauce pan and cook over medium heat until boiling. Whisk the mixture constantly and continue to boil and whisk for about 2 minutes, then remove from heat and whisk occasionally as it cools. Let it cool for at least 10 minutes. In the bowl of a stand mixer fitted with a whisk attachment, whisk the eggs, cornmeal, vanilla and salt until the eggs start to become paler in color. With the mixer still going, slowly add a little of the syrup mixture at a time, tempering the eggs slowly so they don't cook and scramble. Continue to slowly add the rest of the syrup mixture. Mix in the chopped pecans and pour into the pie crust. Place the pecan halves on top in whatever design you'd like and bake on bottom shelf for 50-55 minutes or until the filling is set. Keep an eye on the edges of the crust and add a pie shield or tin foil to the edges if they're getting browner than you'd like. *A pastry blender is an inexpensive tool that makes quick work of cutting butter into flour. *A pie shield is inexpensive and is much easier to work with than tin foil. I have one that does not adjust and it's been fine for most pies but had I realized adjustable ones exhisted when I bought mine, I definitely would have gotten an adjustable one. 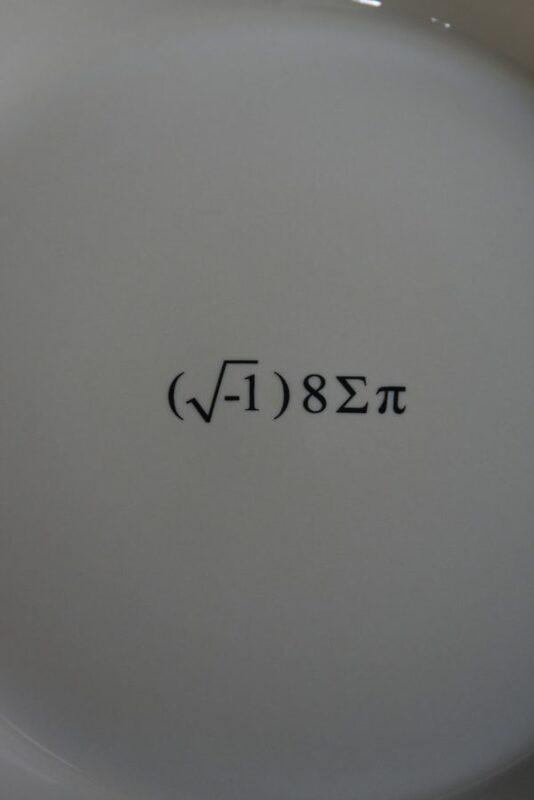 Do you celebrate Pi day? What is your favorite flavor of pie? 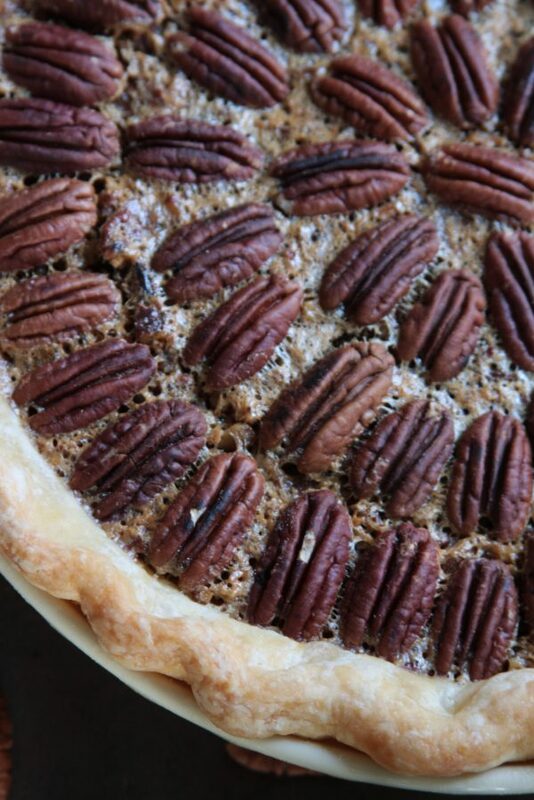 Does this sound like a flavor combo you’d try, or are you a pecan pie purist? Comment below! Powered by Camille - Premium Wordpress Theme Posts may contain affiliate links.